The OpenVPN name is a plus, but just about every other aspect of PrivateTunnel is average at best, underwhelming at worst. A disappointment. 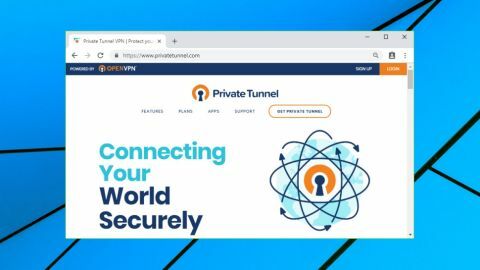 PrivateTunnel is a Canadian-based VPN run by OpenVPN Technologies, the people behind the OpenVPN networking protocol. The service has a small network of just 50 servers spread across 23 regions in 12 countries (North America, Europe, Japan and Hong Kong). Apps are available for Windows, Mac, Android and iOS, and all keep your data safe by encrypting via AES-256. There's built-in blocking of malicious websites, and 24/7 support via email, ticket and live chat if anything goes wrong. Pricing looks reasonable at $6 a month billed monthly, dropping to $2.92 on the annual plan. This only supports use by up to three devices simultaneously, but you can add more at extra cost. A seven-day free trial is available if you're interested. You must register with your email address, but there's no need to provide any payment details. There's also no packet inspection of your traffic, and no throttling or rate limiting of speeds. PrivateTunnel does have some session logging, as the company explains here. "Each time a user connects to our Private Tunnel service, we retain the following data for 14-30 days: the user's source IP address, the Private Tunnel IP address used by the user, connection start and stop time and total number of bytes used." This data is apparently kept to deal with "with billing issues, troubleshooting, service offering evaluation, TOS issues, AUP issues, and for helping to prevent criminal activity performed over the service." Setting up a PrivateTunnel trial was easy, and within a minute or two we were downloading and installing the Windows client. After logging in, the client presented us with Canada as its default server. That was a surprise, as we were testing from the UK, and most VPN apps default to the nearest location. Connect to your chosen server and the client displays its current region and your new IP address (there's no desktop notification of connects or disconnects, so you must watch the client interface to see what's going on). Conveniently, you're able to choose a new server without closing the new connection first. There are just three settings - to launch the client when Windows starts, change the protocol and set the connection timeout - but there's still fractionally more power than you might expect. In particular, the Protocol option doesn't just support OpenVPN TCP and UDP. There are also HTTP Proxy, OBFS Proxy and OBFS-Hybrid Proxy options, perhaps allowing you to get connected even if you're behind a restrictive firewall. There's none of the functionality you'll get with many other VPN clients. No load figures or ping times for servers; no Favorites system; no options to automatically connect on launch, or when you connect to an insecure wireless network; no configurable kill switch or DNS leak protection. This can lead to some potential problems. If the PrivateTunnel service fails, for instance, the client interface warns that the connection has been lost, but it doesn't display a separate desktop notification to warn the user. You could easily be left thinking your actions were protected, when in fact the VPN connection had dropped. All good VPNs should allow you to access at least some geoblocked content, but as websites get smarter at detecting VPN use, this can sometimes be a challenge. US-only YouTube content is generally very easy to access, but we found it was blocked from PrivateTunnel's New York server. It took a switch to the Ashburn server before we could stream content. Netflix was blocked, too, and this time switching servers didn't help. Sometimes a provider might work to change this, use a different range of IPs, but the PrivateTunnel support pages make it clear that the company "cannot provide any assurance that geo-restricted services can be accessed" over the VPN, and 'this includes streaming services such as Netflix, BBC iPlayer [and] Hulu.' If unblocking is a top priority, PrivateTunnel may not be the service for you. PrivateTunnel wasn't any great shakes in our performance tests. UK download speeds ranged from about 35 to 45Mbps on our 75Mbps test line, around 20Mbps slower than most of the top competition. European speeds were also a little disappointing at around 20-30Mbps. That's acceptable for browsing, streaming and most other tasks, but it's also less than many other VPNs. It was much the same story with the US servers, which peaked at around 25-30Mbps, but Hong Kong and Japan did better than we expected, with acceptable download speeds of around 15Mbps. We've seen a lot of VPNs deliver less. The positive note continued with our final privacy tests, as PrivateTunnel successfully concealed our IP address and blocked both DNS and WebRTC leaks. Being run by the people behind OpenVPN is a huge PR plus for PrivateTunnel, but there's little else going for the service. The small network, below-par speeds and lack of features don't fill us with enthusiasm, and most people will be better off elsewhere.